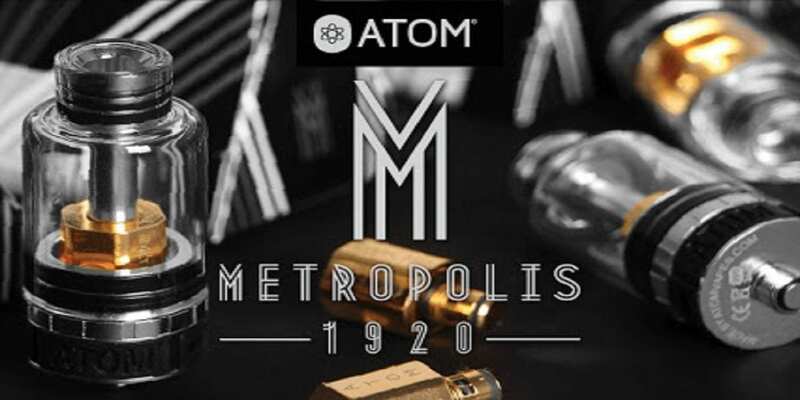 Atom Vapes Metropolis Tanks Review - Daily Vaping Deals & The Best Vape Product Reviews at Vaping Cheap! For the past few days, I have been putting Atom Vapes New Metropolis tank through the paces. 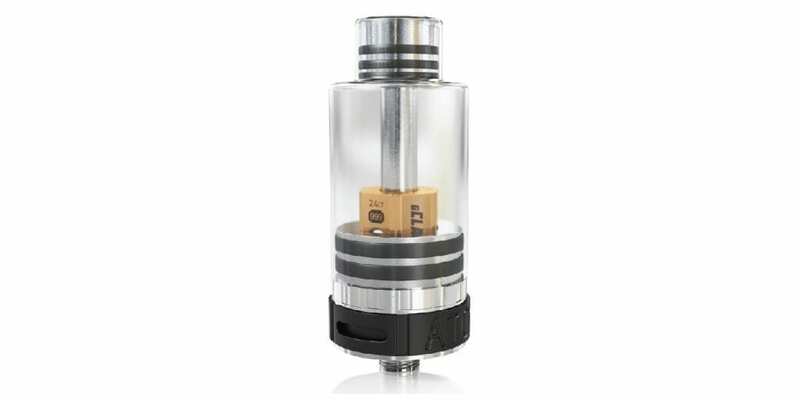 Technically, it is a bottom fill 4ml Pyrex tank with either silver or gold plated internals. Measuring, 52mm x 22mm packs a nice punch while only weighing 36g. 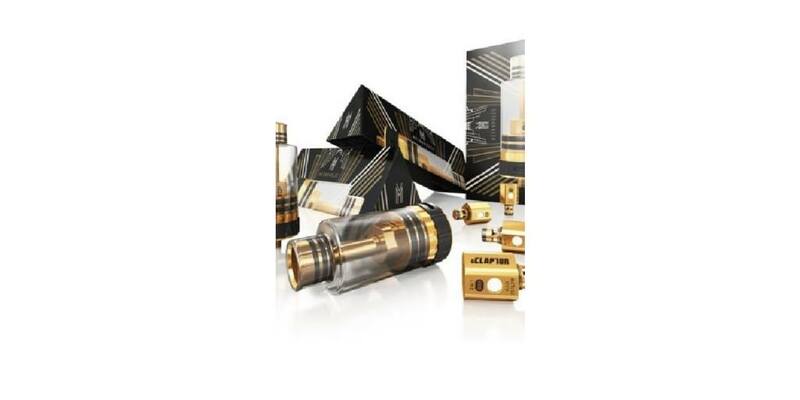 The Metropolis ships with the tank fully assembled with an Atom gClapton 0.5-ohm gold plated coil. Also included in the kit I received a complete O-ring replacement kit and secondary Pyrex glass outer shell. The Metropolis is a very pleasing aesthetic design. Atom Vapes states the design is from the art deco period of the 1920’s. Utilizing multiple O-rings visible through the glass exterior gives the Metropolis a sleek classy look and feel. My first thoughts when opening the packing were this should be obtainable from a vending machine in the game Bioshock. Atom’s use of precious metal to plate the internal components adds to the visual, but also serves a small bit of purpose. The silver plate in the silver tank or gold in the gold tank prevents your juice from contacting anything but glass, precious metal, cotton and coil. This is supposed to prevent any flavor changes. I did notice there was a slight difference to the flavor while using the original coil. For an overall good device, I did find some issues. First, I have never been a fan of bottom fill devices. Too many issues can occur while unscrewing the tank from your device or the coil from the tank without removing it from the device first. Second, it has an all glass exterior, and I am clumsy. However, perspective makes most of these pro-cons, instead of just cons. Second day of use I was asked, what happens if the glass breaks? I removed the 510 connector and coil. I point to the lower O-ringed receiver. “You just remove this section”, I said. “Then use an ink pen or pencil to remove the top O-ringed stem. Take a little e-juice to lube the rings, and slide them in the new glass.” I said, while removing the lower receiver. “That last step is very important. Otherwise you could break the glass.” I said, while reinserting an un-juiced lower receiver back into the glass. The break occurred a few seconds latter while trying to reattach the 510 connector and coil. Upon using the spare glass, I made sure to apply sufficient e-juice to all of the O-rings. This led to another issue. Once the glass is replaced and properly lubricated, it is very easy to remove. This is a problem if it occurs while struggling to get your mod from you pocket. However, refilling by removing the glass from the bottom O-ring connector has been very easy if you are careful not to spill 4ml of e-juice in your pocket. The only major issue I found is the airflow adjustment. The opening for the airflow is two large slots on both sides of the tank. Wide open gives plenty of airflow with a soft pull. The adjustment ring is a simple grooved rubber ring with two slots cut and the brand ATOM on one side. Making adjustments to restrict airflow is very easy. Getting the adjustment to stay is not, since the ring spins freely. After use while night driving I eventually removed the airflow ring. It works well as a shock band on the glass dome. Since the Metropolis uses Kangertech’s thread style, I tried it for a few days with a Kanger Nickel SSOCC for Temperature Control Mods 0.15 Ohm / Range 20 – 45 W Coil. At 20W, the pulls are wispy and airy. At 45W, mild scorching occurs after 4 seconds of pull. However when used on temperature control for Nickel scorching would begin only above 550F at 210W. Using the Metropolis with the Nickel SSOCC, set on Temp Control 45W at 410F produced the best cloud to flavor ratio. Considering the Metropolis is an attractive and functional 4ml tank with tons of coil options, sold in affordable ranges; I would recommend this as a good tank to upgrade for lower wattage starter kits. It has also been a good everyday tank during this review.